I thought I would share with you a picture from my backyard. Aren't they amazing? I can't take any credit for them looking so beautiful. If I lived in the states, I would probably have to do all sorts of things to help them bloom-special soil, covering them in the winter, the right pruning, etc. I did not do any of those things except maybe a little pruning. I live in a worn torn dusty city in Central Asia. 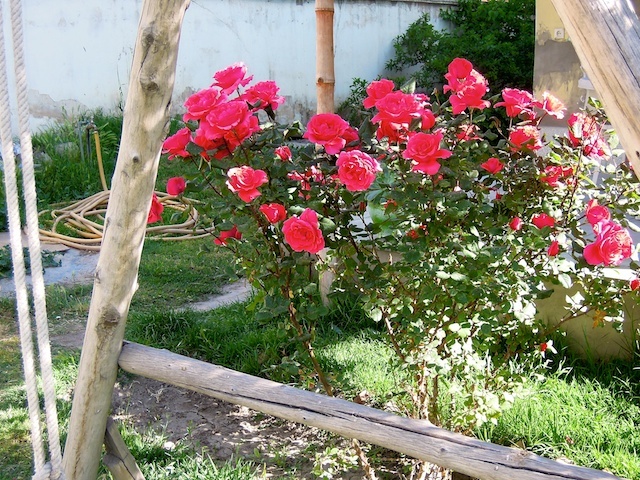 These roses have survived the cold and snow of our long winter. They thrive despite all the dust and the soon to come heat. God has them blooming beautifully and I am thankful. These roses and the other roses in my garden have nourished my soul this past week and reminded me that God can have us bloom in any place He chooses even when we think it is not possible. I see it in the people I live and work with-how God causes us to bloom. Our neighbor would be considered an introvert in his country but here in this land and culture, he has found his niche. He knows the names of many of the guards and shopkeepers. He is an extrovert in this culture fully embracing the language and its people. My daughter who is living in a land where women are considered second is blooming. She has found out she loves to dance. She is learning to speak a new language. To our surprise, she even had a speaking part in the musical this spring. Then there is my teacher friend who teaches first graders. She always has a smile and has found her calling in guiding these little ones in their learning. Her students, all national kids but one, hang on her every word. She often finds time on the weekends to teach the preschool kids at our meetings. In her spare time, she even brings joy and mischief to the chic chalet she lives in. I love this place in spite of the dust, budget cuts, and threats that come and go. God is giving me grace and strength to bloom in this place as I still struggle with the language, raise my family and teach and love on my students. Some weeks are harder than others but that is life isn't it? This week is a bit harder than most as rumors abound of more changes and the time for many dear friends to leave is fast approaching. But then God helps me refocus as I see the roses in my yard and my students especially my girls who are blooming in this land ready to make a difference. He also whispers," I am with you and will always be with you wherever you are." You also might enjoy this post on my rose. I am so glad God sent you roses! Your post fed my soul as well as yours. Thanks for sharing. Praying for you. Feeling rather on the same pages as you, Teresa . . . funny how life works that way sometimes :-) I am so very glad you are enjoying the blooms as well!